BP after the spill: Bankrupt, bought, or business as usual? FORTUNE -- Despite some progress over the weekend to slow the flow of oil gushing into the Gulf of Mexico, BP is still struggling to find a meaningful bright spot since the Deepwater Horizon drilling rig exploded more than a month ago. The London-based oil and gas producer recently announced it won't be until possibly August before crews can permanently stop what has become the biggest oil spill in U.S. history. The event has all the makings of a corporate nightmare: BP (BP) shares have plummeted. Lawsuits have already emerged. The U.S. government has launched criminal and civil investigations into the Gulf Coast oil spill. Its credit ratings have been cut. And the reputation that BP built as being an eco-friendly oil company has been severely tarnished, if not destroyed. Now, analysts and oil industry insiders are wondering just what the future holds for the company. Can BP afford to exist as a standalone company? Could it go bankrupt? Will BP have to cut dividends? Or will it survive intact, bruised a bit but otherwise just fine? Fortune lists four of the most talked about outcomes and weighs their likelihood. Faced with mounting expenses, it's certainly possible that BP may cut payments to shareholders. Last week, the company reported that it has spent nearly $1 billion so far. With a permanent end to the leak still possibly some two months away, it's anyone's guess how much the disaster could eventually cost. Estimates range widely from $3 billion to $25 billion as BP faces potentially thousands of claims from fishermen, restaurateurs and others impacted by the spill. Moody's (MCO) and Fitch both lowered BP's credit ratings last week on worries that the costs could have a severe impact on its balance sheet. Investors rightfully wonder if the final tally could prove too much for BP to handle, forcing a dividend slash. The longer it takes to plug the oil spill, the more those chances rise. BP currently pays $3.36 per share in annual dividends -- that amounts to about an 8.6% dividend yield at today's stock price. If there is a change to the dividend, it might likely be driven more for the sake of appearance than purely financial survival. Transocean (RIG), which owned and operated the rig that exploded and triggered the oil spill, drew criticism for announcing a $1 billion payment to shareholders in May. BP's shares have fallen about 40% since the start of the disaster. With such a dramatic drop in market capitalization, it's hard not to wonder if the company's stock could get so cheap that a competitor swoops in for a takeover. But even if shares fall much further, BP may not be much of a bargain. Few would want to inherit BP's baggage -- risks, by the way, that are still fluctuating and hard to quantify. 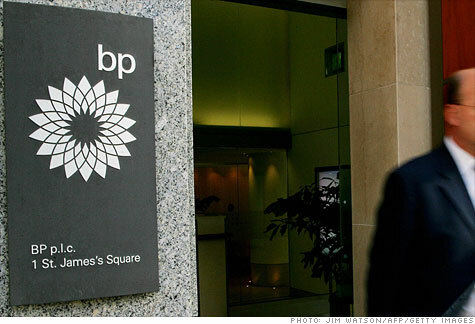 0:00 /3:16Can BP afford to keep its CEO? "Why in the world would any other company want to drag themselves into the middle of the litigation nightmare that BP could potentially get into for years to come?" asks Pavel Molchanov, an analyst with Raymond James. It's not as if BP hasn't explored a merger in recent years. In 2004, the company and Royal Dutch Shell (RDS) talked about a possible merger under CEO Tony Hayward's predecessor, John Browne. It wouldn't be surprising if executives at Shell were crunching the numbers right now. But given BP's enormous footprint in the U.S. and Europe, any potential combination would face another hurdle: approval by the U.S. Federal Trade Commission and the European Union. In a more dramatic scenario, what are the chances of BP dissolving altogether or undergoing a major reorganization under Chapter 11? This could happen if the company's financial picture becomes so weak that the business can no longer operate. While ongoing cleanup and damage costs are expected to be quite high, those payments alone won't likely force the company under. The bigger threat is the potential costs from BP's myriad of spill-related lawsuits, which so far range from compensation for personal injury to lost business to environmental damage. And this might just be the beginning, with the U.S. government considering moving forward with its civil and criminal investigations into the oil spill. Eventually, the flood of suits could become too much for BP to handle while the company deals with serious drops in its stock, says Peter Tamposi, an attorney and professor in bankruptcy law at the Franklin Pierce Law Center in New Hampshire. True, Exxon is still standing following the 1989 Valdez oil spill in Alaska. Litigation took about 20 years to resolve. And after lengthy appeals, damages that were at one point in the billions of dollars were reduced down to millions. But the scale of impact along the Gulf is much bigger. Cases are being filed from all over the Southeast, including Texas, Louisiana, Alabama, Mississippi and Florida. "At some point, it becomes too difficult for the company to manage both financially and logistically," Tamposi says. "You're going to have BP professionals essentially being lawyers and not oil drillers. It could reach a point where it won't make sense to continue going on." Whatever the fate of BP, the company will be forever changed. For the next several years, it will likely have to deal with new regulations changing the way it does business, ongoing reputation control and a plethora of legal headaches. These costs -- tangible or not -- will quickly add up. And that is something that no green marketing campaign can offset.